Peoplewho are actively involved in the management of sports fishing via advisory boards are calling on all anglers to respond to an invitation for input to DFO on revisions to the Critical Habitat Section of the Species at Risk (SARA) Recovery Strategy for Northern and Southern Killer Whales. Input must be provided by July 11, on a prescribed online comment form.As many of you know, this is a similar “consultation process” to what was used to arrive at the eventual implementation of a SRKW Refuge Area Recreational Fin Fish Closure in Areas 20, 18 and 29. The current practice is to use Area Refuge Closures as opposed to implementing equally effective 400m bubble zone strategies. Going forward, one of the likely outcomes of expanding the critical habitat to include Swiftsure to LaPerouse Banks will result in similar Area Refuge Recreational Fin Fish closures (closed to all fishing). Once these are in place it is highly probable the closures become permanent. Please review the map that sets out the area proposed to be set-aside as critical habitat. Area SRKW Refuge Recreational Fin Fish Closures will cause significant socio-economic harm destroying jobs and economic spin off activities in small coastal communities like Ucluelet, Port Alberni, Bamfield, Port Renfrew, Sooke and Victoria. Killer whales are only very rarely present on LaPerouse Bank, and there is no documented evidence from passive acoustic monitoring to clearly demonstrate this is actually critical habitat. 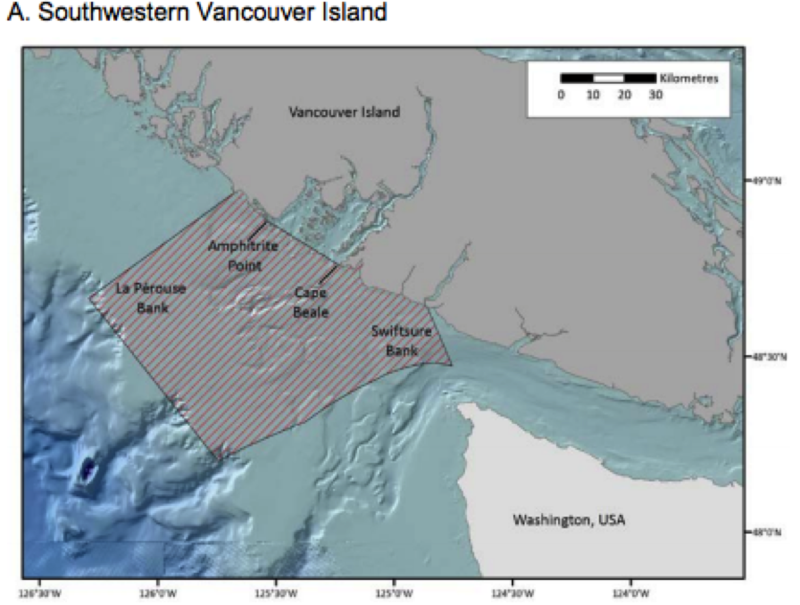 DFO science is making an assumption that because areas of LaPerouse Bank are important areas for commercial and recreational Chinook fishing that they area similarly important to killer whales. According to Passive Acoustic Monitoring (PAM), killer whales are only present on Swiftsure Bank 43% of monitored days between May to September – broad Area Refuge closures impact recreational fishing opportunity during significant periods where the whales are not present. Given these observations, there is little scientific data to support expanding the critical habitat areas, especially on LaPerouse Bank where killer whales are very rarely encountered and there is no scientific evidence to support DFO Science claims. Fisheries and Oceans Canada (DFO) and the Parks Canada Agency (PCA) would like your feedback on the revised critical habitat section (section 7) of the Species at Risk Act (SARA) draft Amended Recovery Strategy for the Northern and Southern Resident Killer Whales (Orcinus orca) in Canada. The deadline for submitting comments on section 7 (critical habitat) of the draft Amended Recovery Strategy is July 11, 2018. Please note, feedback is only being sought on section 7 (pages 55 to 68); feedback on other sections will not be considered at this time. If you choose to submit comments, please use the online comment form. After we have received your feedback and finalized the draft Amended Recovery Strategy, a proposed document will be posted to the SARA Public Registry for a 60-day public comment period. The Government of Canada will then have 30 days to incorporate comments before posting the final document on the Species at Risk Public Registry.